Water levels at the City of Port Alberni's water sources are good for now, according to waterworks chargehand Amar Giri. City of Port Alberni waterworks chargehand Amar Giri checks the rainfall gauge at the China Creek intake on Monday. The drought that dried out Vancouver Island last summer isn’t likely to return this year, according to B.C River Forecast Centre head forecaster Dave Campbell. “What we’re seeing right now is 99 percent of normal snowpack so pretty much what you’d expect a normal snowpack to be at this time of year,” said Campbell of Vancouver Island’s current conditions. Last year, Vancouver Island was at only 15 per cent of normal snowpack in April. While the River Forecast Centre doesn’t measure the Alberni Valley’s water sources—China Creek and Lizard Lake for the city and Beaver Creek, and Lacy Lake for Cherry Creek—Campbell assured that what is measured Island-wide is representative of Port Alberni. 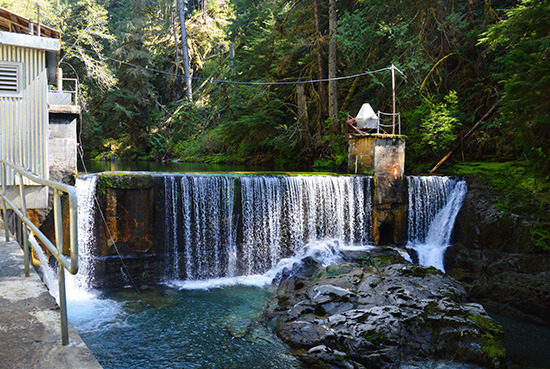 China Creek (shown below) is as full as it should be this time of year, said City of Port Alberni waterworks chargehand Amar Giri. “Everything is topped up, it’s all full and it’s overflowing,” he said. “The only thing that doesn’t come out in the number, and is an unusual thing this year, there’s quite a strong gradient from the high elevation sites to the mid elevation sites,” he said. That mark, Campbell added, is at about 1,000 metres. The hard snow line is likely the result of a warmer than usual winter. “We’re seeing that province-wide and it’s really the result of the warm winter we’ve had; and particularly when we get to Vancouver Island, it’s already much warmer than the rest of the province,” said Campbell. Apart from being warmer than the Interior, Vancouver Island’s mountains are mostly lower in elevation than mountains are on the mainland. The Alberni Valley is a little more unique, said Campbell, with a lot more mountains hitting the upper elevations with more snow on them—meaning that the region is probably doing better than others on the Island. “We do a forecast for the Cowichan River and our forecast has that at about 75 per cent of normal and it’s probably reflecting some of that lacking mid-elevation snow,” he said. Lizard Lake is sitting at 728 metres of elevation, surrounded by mountains that get covered in snow during the winter months. Now they’re clear of any, according to Giri. “There’s no snow there now, which is pretty standard for this time of year,” said Giri. “As water stops flowing into Lizard Lake it will be time for restrictions,” Giri added. In 2015, under the harshest drought conditions Vancouver Island had seen in recent history, the city introduced water restrictions on June 8. According to city engineer Guy Cicon, that was the earliest date the city had introduced restrictions in more than two decades of his working with the municipality. “I only recall having water restrictions twice in the past many years,” he said at the time. The city went to stage 2 restrictions for the first time Cicon could remember on July 14 but continued to do better than many other places on the Island. The Regional District of Nanaimo went to stage 4 and others on the Island reached stage 2 much earlier than Port Alberni did. This year, with a much less severe situation, the city is taking a wait-and-see approach. Currently, two regional districts on the Island have already imposed water restrictions for 2016. The Regional District of Nanaimo has gone to their first stage of water restrictions, which prohibits watering between 7 a.m. and 7 p.m. The Comox Valley Regional District is also at stage 1 but according to their water conservation bylaw, the restrictions are year-round. Campbell said that while the River Forecast Centre doesn’t monitor watersheds specifically, the Island is in good shape. “We’re definitely not in as severe of a situation as we saw last year. That snow line was much higher than we saw this year and it was essentially above where the land was and so we didn’t have much snow at all. We’re definitely coming into this season in much better shape,” he said. The Island also doesn’t rely on snowpacks for its water supply as much as the mainland does. “In a normal year, there’s only so much terrain at that higher elevation that receives snow and as a result most of that water that’s cycled through the watersheds here really comes from rainfall rather than snow. So the less snow at mid-elevation will have some effect but it’s not quite as dramatic as rivers in the interior part of the province where most of the flow comes from that melt,” Campbell said, adding that the effects of snowpacks won’t be felt till late summer.